2 Room Suite – Queen bed and sofa in first room. Queen bed and two twin beds (trundle) in second room. Sleeps 6, TV/VCR/DVD, Rooms have separate patio entrances, Combined shower/jetted tub, Kitchenette, Private patio with barbecue. View of Main Canyon and the cliffs, Queen bed, TV/VCR/DVD, Combined Jetted tub/shower, Inside and Outside entrance. King bed, TV/VCR/DVD, Fireplace, claw-foot soaking tub in a sunny sitting room, separate shower, private balcony overlooking the Escalante river. King bed, TV/VCR/DVD, Double jetted tub next to a kiva fireplace, separate shower, spacious balcony with view of the Escalante river and Native American archeological site. King bed, TV/VCR/DVD, two-way fireplace between the bedroom and corner jetted tub, separate shower and patio entrance with easy parking access. This new eco friendly building is sided with reclaimed wood from a beautifully weathered old barn. The upper-level Moonrise room looks over our pastures, the Escalante River and towards the Escalante Monocline of the Grand Staircase Escalante National Monument. A private balcony with zero gravity (reclining) chairs is perfect for star gazing under the dark skies. A posturepedic Cal King ease adjust bed. Full kitchen, SMART TV, shower and state of the art AC and Heating. A full breakfast at the inn is included. This room is located in the bottom section of our new eco friendly building. The building itself is sided with reclaimed wood from a beautifully weathered old barn. 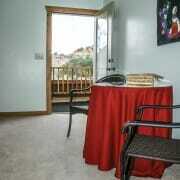 Kitchenette, SMART TV, shower and state of the art AC and Heating. A full breakfast at the inn is available at the Inn for an additional cost. Isaac Riddle Log Cabin – 1600 sqft, 3 levels, 2 bedrooms, top bedroom with queen bed and half bath, Lazy-boy® and bathroom on main floor, two queen beds with futon and full bath on lower level, full kitchen, living room with fireplace, washer/dryer, TV/VCR/DVD, wraparound porch, BBQ. Please Note: there will be a $60 cleaning fee for groups of 6 or more. 14 days for the cancellation policy. *All rates are based on availability and double occupancy. CABIN: $10/additional person – INN: $15/additional person. Some restrictions apply. Special rates are not available on major holidays or major weekends. Breakfast is included with Inn rooms and can be purchased by cabin guests with advanced notice (adults/teens $10, children 12 and under $5). Deposit: (rate for first night) is required for all reservations. Cancellations: subject to a $25.00 per room cancelled fee. Reservations cancelled within 7 days of arrival date will be charged the full reservation fee (unless the reservation can be re-booked). There will be a $15.00 additional fee per roll-away bed and a $10.00 additional fee per foam mattress. Coming back from a day of adventure can be topped off with a relaxing experience in a jetted tub. Your hosts will prepare delectable offerings for each morning’s breakfast including: Fresh granola, fruits & juices, homemade bread, jams & jellies and a hot entree. Breakfast (with advance notice) is available at the inn– $10/teens and adults, $5/ children. Enjoy socializing with other guests, reading from our library or shopping from our small but unique collection of gifts. Browse the Internet for news or relax with a hobby in a corner nook. We now have wireless internet. There are few places on earth that offer better viewing of the stars. Our location away from the town of Escalante places us in a prime spot for clear viewing of the constellations as they pass overhead. The milky-way was never so milky! The Dixie National Forest is close by and a short drive can put you deep into the Ponderosa Pines with mountain lakes and streams to accent your views. The North Creek flows from the back of our canyon and circles around to the front of the property where North Creek and Birch Creek become the Escalante River. Wildlife come here to drink and you’ll have ample time to view wild-turkey, deer, and a host of other animals and birds. Two six-foot waterfalls stair-step below a bridge near our property. You can walk to these and play in the falls or wander up and down the stream. Ancient writings dating back thousands of years dot the walls of the cliffs behind the Slot Canyons Inn. More recent writings from early Pioneers can also be found. In addition to the Pictographs and Petroglyphs there are ancient Indian dwellings and storage structures on our property. Recent research has found that humans have lived on this property for the past 10,000 years and you’ll see much evidence of this as you walk to historic sites close to your room. Plateaus, pinnacles, caves, slot canyons and many other rock formations are all close by. Some of these within minutes of your room.